Was there, for the first time from the prime minister, a recognition that he cannot go on like this and will not now hang on to the bitter end? His monthly press conference crackled with the anticipation that, this time - unlike so many before it - it really had to deliver. 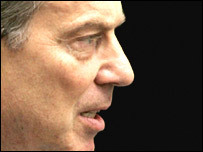 And deliver it did - in spades if you are of a mind to accept Tony Blair's nods and winks unquestioningly. But even for the cynics there was at least enough to think the last two weeks may have shifted the political landscape irrevocably. In some carefully worded pronouncements Mr Blair, looking far less confrontational than we had been led to believe, delivered something significantly new. He dropped the defiant old "here to serve a full third term" stuff, in favour of an entirely different form of words. And it was all about standing down soon enough to give his successor time to establish himself, or bed himself in. "There are those who genuinely want me to honour the commitment to a stable and orderly transition. And I repeat, I will honour it, with the time plainly needed for my successor to establish himself," he volunteered. 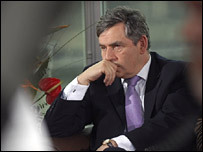 He gave the clearest assertion yet that Gordon Brown was indeed prime minister-in-waiting. "Of course he is. When have I ever said anything different? That is why I suggest everyone calms down and lets us get on with the business of governing." And he even dropped a large hint that he had talked about all this with the chancellor. Maybe they have another deal? We will undoubtedly find out soon enough. All of this may look flimsy, but - as the prime minister also said - to announce a precise timetable for the handover of power to Gordon Brown would "paralyse" the government. It would certainly ensure he would be seen both at home and abroad as a lame duck - a label he is already attracting. So, with the clamour for either a handover timetable or his head growing, he somehow had to send out the message to his MPs that they need not worry, it is all in hand. And they won't have to wait forever. How much longer is, by necessity, not on the table and there are those who will still want to hear a date or they may continue demanding his head. The prime minister has discounted plots to topple him, as he sees them, coming from his left-wingers - the "usual suspects" - as the swiftest way back into opposition that anyone could devise. But he doesn't need to worry about them, they are always going to be there and they do not have the numbers to do him in. He does, however, have to worry about those he branded "the reasonable end of the market", but who are also becoming increasingly restless and even rebellious. It was to these MPs he was delivering the reassuring message that, if they calm down, they will get what they want without, at the same time, distracting the government from the major policy tasks ahead. Will they buy it. Has Gordon Brown already bought it. And will it succeed in heading off the storm? The signals that now come from Mr Brown, both publicly and privately to backbenchers, will help answer some of those questions. If they are the right signals, then the immediate whirlwind may very well subside. If those reassuring signals do not come, or if Tony Blair's MPs simply do not trust him to deliver then it will rage with potentially lethal force for some time yet.